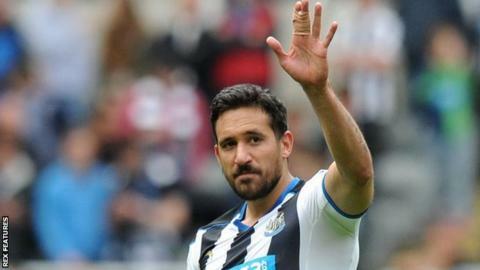 Midfielder Jonas Gutierrez was dropped by Newcastle United because of his cancer diagnosis, an employment tribunal has found. The 32-year-old was suing the Magpies for about £2m on the grounds of disability discrimination. The tribunal also ruled the club made it impossible for Gutierrez to trigger an appearance-based contract extension. Newcastle say they are "dismayed" by the judgement and are considering further options with their legal team. Gutierrez's barrister Martin Budworth said: "The tribunal has made it clear that a Premier League football club owes the same duties to a disabled person as any other employer." A further remedy hearing will be held in due course, in which compensation will be addressed. Although Gutierrez has not released a statement, he did post on social media, saying: "Always in my heart Geordie nation. I love you." He had been a regular at St James' Park before that time, scoring 10 goals in 177 appearances at the time of the return of the illness and subsequent treatment. Gutierrez, now playing for Deportivo La Coruna in Spain, also alleged that he was not selected for some of the second half of the 2014-15 season, when the Magpies avoided relegation on the final day of the campaign, so the club would not trigger an automatic one-year contract extension. The tribunal found that Gutierrez was discriminated against following his diagnosis and subsequent return to fitness as it deemed he was considered part of the club's plans right up to the point of his absence. Gutierrez "had maintained his place in the starting line-up without difficulty for five years." "Just over two weeks after the claimant returned to the club in November 2013 following his diagnosis and treatment, and at a point when he was match fit and returning to action he was told that he no longer featured in the club's future plans. We conclude that the decision to drop the claimant was because of the claimant's cancer." The tribunal also concluded that Gutierrez was not considered for selection following his return to fitness until he could not achieve the 80 Premier League starts required over the length of his four-year contract to trigger the extension. As a result of his absence because of cancer, Gutierrez had only 121 games instead of 152 to earn his extended deal and the club had discriminated against him by failing to make reasonable adjustments. "It was in essence more difficult for the claimant to achieve the required number of games because in the periods of time that he was not absent for treatment or rehabilitation he had to be more frequently selected as a proportion of the total number of games available than his non disabled counterparts. We conclude that this was a substantial (more than minor or trivial) disadvantage." "Had the possibility of a triggering of the clause not been an issue then Mr Charnley [Newcastle managing director Lee] would not have needed to discuss it at all with Mr Carver [former manager John] and would not have needed to double check how close the claimant was to triggering the clause." Claims of unfavourable treatment were rejected, as his move to Norwich City on loan in January 2014 was consensual. A claim of harassment which related to Gutierrez training and playing with the under-21s was also dismissed as the tribunal ruled that many players, such as "Davide Santon, Siem de Jong and Gabriel Obertan" were required to do so to gain match fitness after injury. Parts of John Carver's evidence were "vague" and "rejected"
Gutierrez was found to be a "credible and convincing witness". Former Newcastle boss Alan Pardew "was able to deliver his evidence in a confident, convincing and articulate way". However, "the detail of what was said was not necessarily as credible as the manner in which the evidence was delivered". Some of Pardew's evidence was deemed to be contradictory and "inconsistent". Managing director Charnley's evidence was described as "evasive and lacking in credibility". Parts of former Newcastle boss John Carver's evidence were "vague" and were "rejected". In August 2013, Newcastle's doctor club advised that Gutierrez, who was recovering from a hamstring injury, should be picked as a substitute "at the very most". Pardew had picked Gutierrez to play and told the hearing that he "did not understand" the doctor's advice, a claim the tribunal considered "improbable". Pardew was dismissive of the doctor's notes in Gutierrez's medical record, which read: "Somehow managed to start game against Manchester City. Manager's decision, against medical advice." Charnley would not accept that Gutierrez was an established international player, despite winning 22 caps and playing at the 2010 World Cup for Argentina. Charnley "could not say" how many international players Newcastle had in their squad in September 2011. Charnley said that Gutierrez's 71 starts in 76 games in 2011-12 and 2012-13 only "demonstrated someone who plays for the first team" and not consistent performance. Carver told the tribunal that Gutierrez "had a certain clause in his contract if he reached a certain criteria". He later said there was no discussion about the clause and denied knowing what the "certain criteria" might be.